Reducing usage of pesticides and fungicides is of high importance for a sustainable bioeconomy. Insect pests and microbial pathogens are major causes of crop losses worldwide, which sum up to about US$500 billion per year. The BiFuProts project aims to develop a broadly applicable bifunctional platform of fusion proteins (leaf binding and antimicrobial function) for pest management and reduced fungicide use. Bifunctional fusion proteins (BiFuProts) are composed of a plant leaf- anchoring peptide and an antimicrobial peptide for pest management. The BiFuProts technology was successfully validated to protect soybean plants against the soybean rust (SBR) pathogen P. pachyrhizi. The designed BiFuProt_2 showed a reduction of ~30-35 % of SBR disease severity and most strikingly, the unique plant protection capacity of the BiFuProt_2 prototype was fully retained after exposure to simulated heavy rainfall prior to inoculation with P. pachyrhizi (simulation of application conditions). Characterizations of plant surfaces, BiFuProt deposition properties on leaves and rainfastness ensured the development of a demand-matching technology platform. 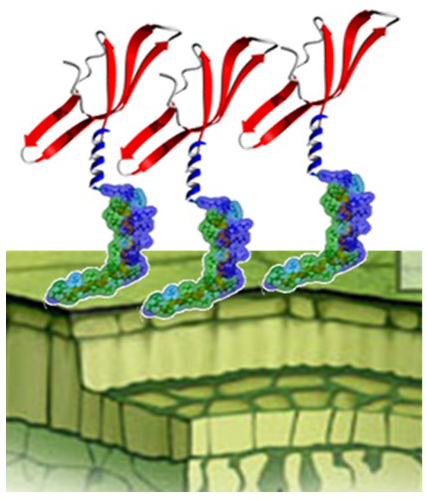 The generated data clearly proves that the identified anchor peptides are able to enhance the binding capability of foliar-applied antimicrobial substances to leaf surfaces, thereby increasing of active ingredients, which substantially increase the biological efficacy of their fusion products (e.g. bifunctional fusion proteins for pest management, foliar fertilizers). Anchor peptides and BiFuProts remained under controlled conditions in a growth chamber for more than 3 weeks with significant peptides loading potential (43-71%) on leaf surfaces and withstood simulated heavy rainfall (> 5 mm hr-1) as well as natural rainfall at ambient field conditions for barley, soybean and apple. No phytotoxic symptoms or negative effects on leaf physiology were observed, even when high BiFuProt concentrations (10, 50 or 100 µM) were applied. Characterization of rainfastness and deposition properties on leaves ensured a demand-matching technology platform development and contribute through a reduced use of fungicides to the general aim of the Bioeconomy Science Center for a sustainable and integrated bioeconomy in which discipline boarders are bridged and innovative solutions are developed. The BiFuProts technology platform therefore opens an avenue towards more efficient crop protection and a more sustainable agriculture. The total budget of BiFuProts is € 650.838. BiFuProts is part of the NRW-Strategieprojekt BioSC and thus funded by the Ministry of Innovation, Science and Research of the German State of North Rhine-Westphalia. Alexander, A and Hunsche, M (2016). Influence of formulation on the cuticular penetration and on spray deposit properties of manganese and zinc foliar fertilizers. Agronomy 6(3): 39.